Five performers are highlighted in individual coloured spotlights. From left to right; In a green spot, Dayo, a tall slim black man, stands proudly. He wears crisp white scrubs with green details. In a blue spot, Imogen, a petite and curvy white woman poses fiercely. She wears animal print, feathers and clawed gloves. In a yellow light, Cian, a white man with a big smile, wears a pink babygro and nappy. He holds a teddy bear and a giant baby bottle. In a red light, DJ, a mixed race man, leaps into the air, arms stretched, toes pointed. He wears a leotard with pink and green leaf print and tassels. In a purple light, David, a white man, looks resolute. He wears a white vest and shorts. He is chained by the neck, wrists and ankles. A page from the Paradise Fields PLC brochure. Jess Mabel Jones reclines on a grey sofa holding a mug. She wears a pink skirt suit and wide smile is condescending. A dank, run-down and arched basement hallway. Paint is peeling from the walls. 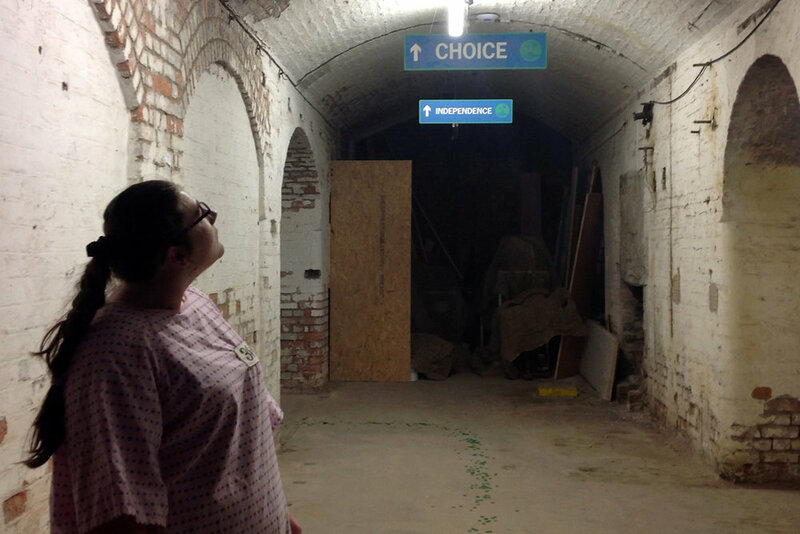 A woman wearing a pink hospital gown looks up to two signs that read ‘Choice’ and ‘Independence. A pink and uninviting room. Paint is peeling from the walls and there are pipes on ceiling. Cian Binchy, a tall white man, wears a pink babygro and nappy. He stands inside a huge pink cot. Jess Mabel Jones wearing a pink suit speaks to a tour group. A white room. 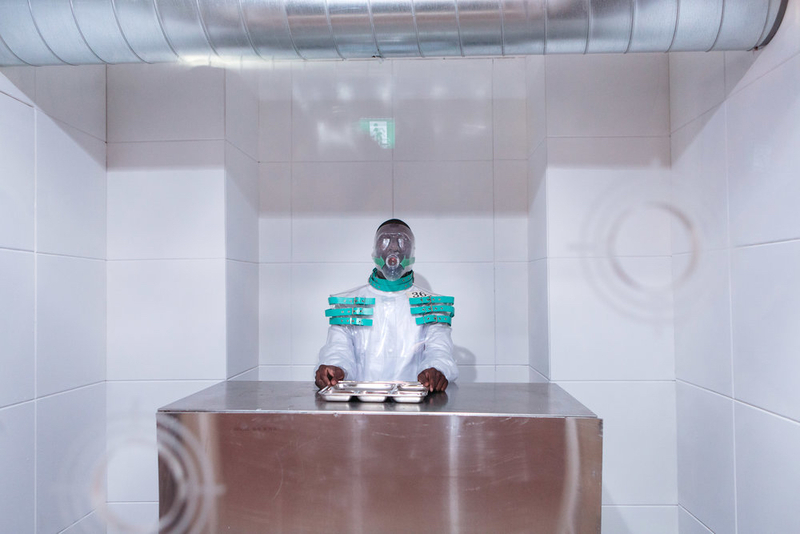 Dayo Koleosho, a black man, wearing crisp white scrubs with green details, sits at at table. A silver food tray is in front of him. Imogen Roberts, a petite and curvy white woman poses fiercely. She wears animal print, feathers and clawed gloves. She dances on a a podium backed with yellow florescent lights and green foliage. The space is club-like, exotic and otherworldly. A pink and uninviting room. Cian Binchy, a tall white man, wears a pink babygro. He stands inside a huge pink cot. Jess Mabel Jones, standing outside of the cot wearing a pink suit, listens into a earpiece. 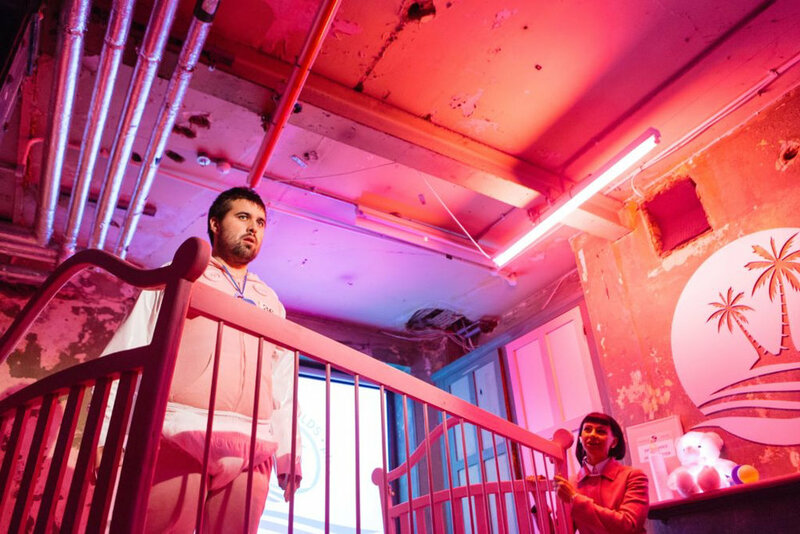 Inspired by a refusal to be silent, and a history of being ignored, 5 neurodiverse artists from Access All Areas take us on an immersive adventure underground into the horror that is Paradise Fields Care PLC. A goddess, a baby, a bird, an eater and a ghost guide us through a labyrinthine institution, growling to be heard, and waiting for the revolution that is forever promised. 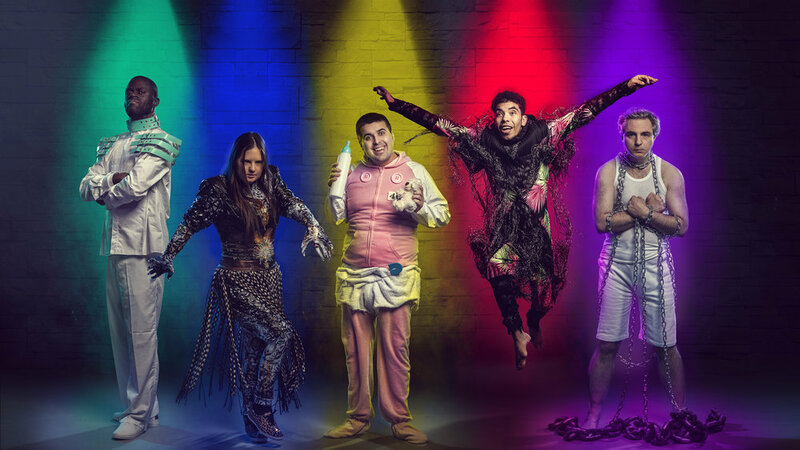 As they tear back the walls to their lives, past and present spin together in a powerful expression of what it feels like to have a learning disability in Britain today. Developed with Barbican Centre, Shoreditch Town Hall, The Lowry, Battersea Arts Centre, Wellcome Trust, Arts Council England, and the Open University.